Amara Raja Batteries Head for South Asia Manish Tuli and Director Ayaz Uddin Ripon unveil a motorcycle battery – Amaron – at a function in the capital recently. Amara Raja Batteries Ltd (ARBL), manufacturer of Amaron Automotive batteries and India’s lead-acid batteries major, launched motorcycle battery in Bangladesh. 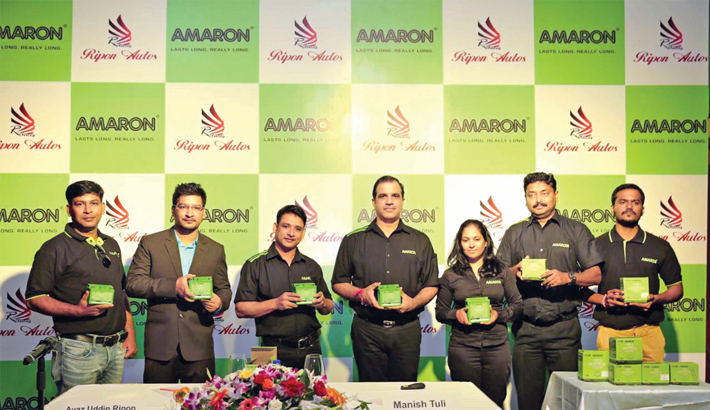 The launching ceremony was announced jointly by Manish Tuli, Head Amaron –South Asia of ARBL, Sajit Kumar and Ayaz Uddin Ripon, Director and Chief Executive Officer, Ripon Autos, the authorized distributor for Amaron motorcycle batteries in Bangladesh, said a press release. Amaron is offering maintenance-free and long-lasting motorcycle batteries. Commenting on Amaron’s future initiatives, Manish Tuli, Head Amaron –South Asia, ARBL said, “Bangladesh, predominantly being a two wheeler market.